Problem: We share more of our daily lives than ever before via social media, but this can leave less tech-savvy older generations in the dark. Solution: Revitalize and revamp the Walgreens photo dept. with a subscription service that lets users send photos straight to their grandparents. 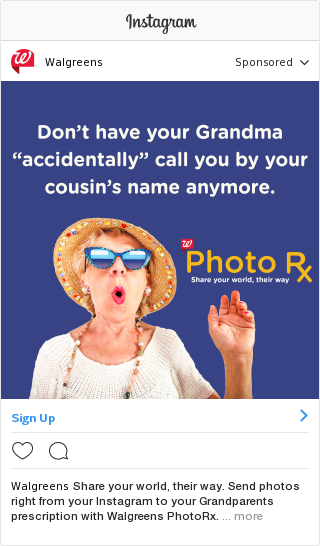 Portal for subscribers to connect to their grandparents' prescriptions & select photos to send. Photos will arrive with the receiver's prescription. The first time they receive PhotoRx a letter will be included to let them know all about the service.